« See you at PorcFest! 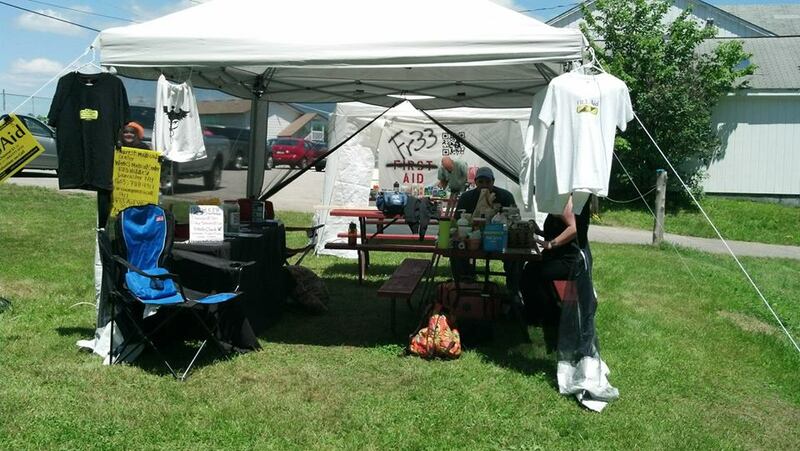 The Fr33 Aid team supported another great PorcFest this year. Sixteen volunteers took shifts at Fr33 Aid’s booth to provide first aid as needed to PorcFest participants, including a lifeguard who met us at the festival and jumped right in to help. 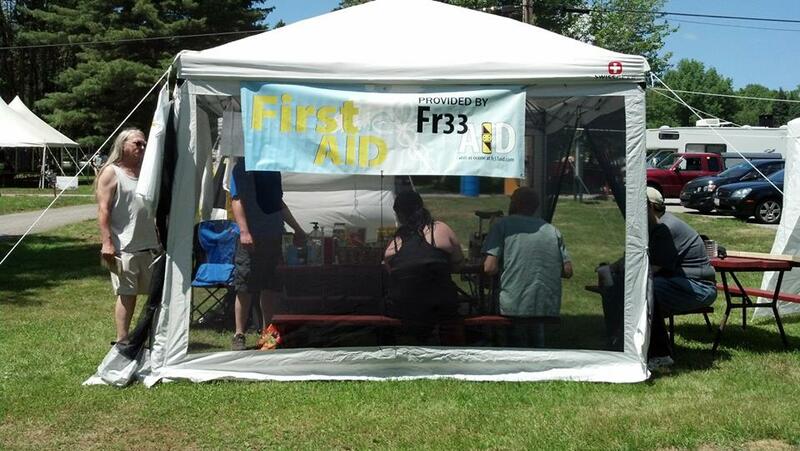 Among the Fr33 Aid volunteers at PorcFest, there were 2 paramedics, 3 EMTs, 2 nurses, 2 lifeguards, a nurse practictioner, a midwife and several basic first aid providers. Because of the fundraising work and generosity of Bitcoin Not Bombs and other donors, we were able to offer a 1-bitcoin travel subsidy to proven volunteers for PorcFest this year. This enabled some of our volunteers to join us for longer than they had planned without the subsidy. This year Fr33 Aid volunteers treated an increased number of bug bites and similar numbers of cuts, scrapes, blisters and drug reactions compared with prior years. 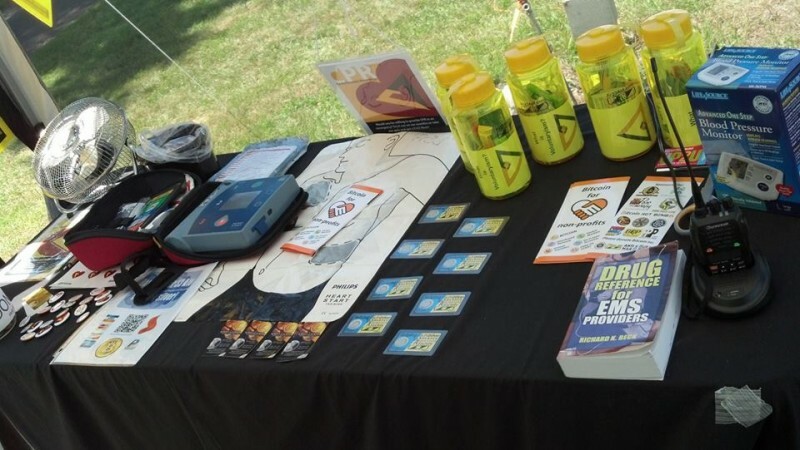 One participant with a chronic medical condition experienced a seizure and was transported to the hospital; he returned to the festival the next day. One person sprained her ankle and made use of Fr33 Aid’s crutches after her ankle was wrapped. Another person had an asthma attack triggered by campfire smoke. One person was checked and cleared for broken bones after some inadvertent acrobatics at Buzz’s Big Gay Dance Party; he received an ice pack and a recommendation to limit activities while his leg recovered. On the last day, one person had eye pain and distorted vision that wasn’t resolved after treatment with eye wash; our volunteer recommended the patient stop at the medical center on the way home from PorcFest. Another person fell hard on his head and shoulder, reporting back pain and tingling in his left arm; he was transported to the hospital for a more comprehensive check. 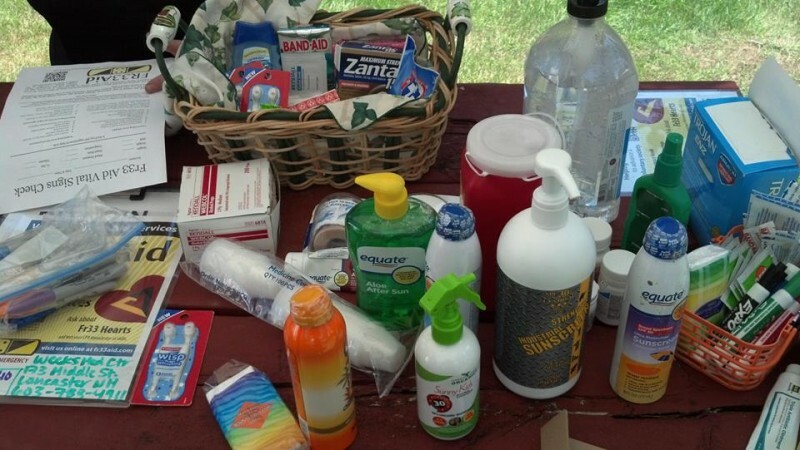 At this year’s PorcFest, we offered an increased array of pharmacy items, including Sam splints, crutches, eye wash and liquid medicines, among other things. These came in handy and rounded out our other items like ibuprofen, acetaminophen, sunscreen, bug spray, bandages, ice packs, tampons, condoms, etc. Fr33 Aid offers these items for free and requests donations so that we can replenish our stock for future events. 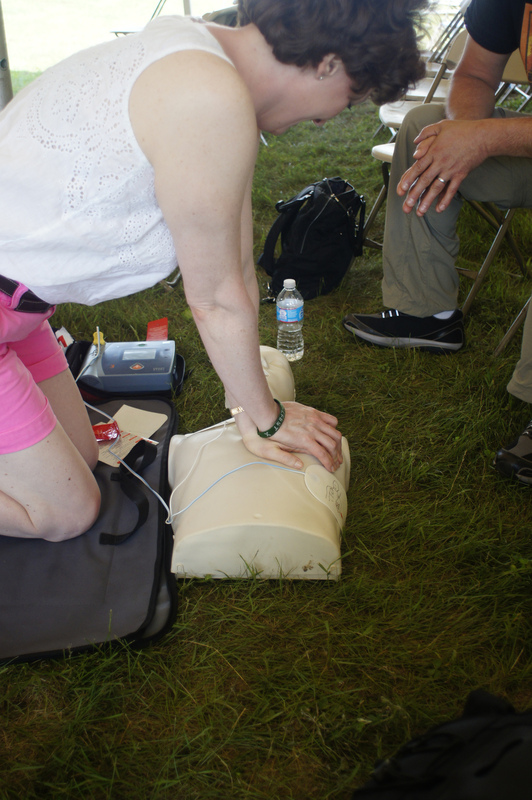 As in years past, we provided CPR workshops at PorcFest. These workshops allowed participants to practice CPR on our manikin and learn how to use our automated external defibrillator (AED) in case of a cardiac arrest. Thanks to the generous donation of an AED training battery from Kevin Freeheart, workshop participants were able to learn what it’s like to use the defibrillator when someone needs a shock and in various other emergency scenarios. We also offered free vitals checks, including height, weight and blood pressure measurements, but likely due to the last-minute addition to our program and lack of promotion, there weren’t many takers. Next year we will work with the organizers to include the times of our vitals checks on the main schedule. We were pleased that two friends of Fr33 Aid were winners of Soap Box Idol and the Agorist Pitch. Meghan Lords, who works with Fr33 Aid’s longest-time sponsor, Roberts & Roberts Brokerage, won Soap Box Idol with a passionate reading of her poem, “Bug Splat, etc. etc.” And Davi Barker of Bitcoin Not Bombs won the Agorist Pitch with his idea for Voluntaryist Psychological Experiments in the tradition of the Milgram Experiment. 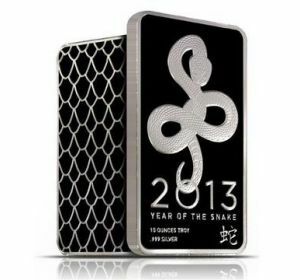 The grand prize for the Agorist Pitch, a 1-oz Liberty Dollar gold round, was contributed by Roberts & Roberts Brokerage, as was the third-place prize, beautiful 10-oz silver bars. Fr33 Aid received about 8.25 bitcoin at this year’s PorcFest, equivalent to about $900 at the time. More than half was received directly in bitcoin, including a large portion that came through the Lamassu Bitcoin Machine located at Revolution Coffee a few sites down from us in Agora Valley. In addition, we received various silver rounds, though not as much silver as we’ve seen in years past. As with prior PorcFests, about one-third of our donations came from cash “tips” to the donation jar in front of the register at George’s Famous Baklava. We are very grateful to Mandrik and all of the GFB employees for their support over the years. Bitcoin Not Bombs continued its t-shirt fundraiser at PorcFest, which benefits Fr33 Aid, the Free State Project and Anti-war.com; those proceeds are not included in our total yet since they’re still being calculated. 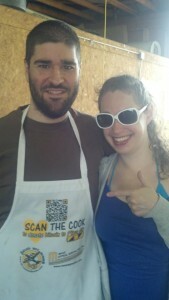 Mass Appeal Specialties printed “Scan the Cook” aprons for all food vendors at PorcFest, displaying Fr33 Aid’s bitcoin QR Code for donations. Matt Whitlock of Lamassu pledged to match all donations to Fr33 Aid that went through the Bitcoin Machine to the Free State Project and vice-versa. This led to over 3.5 bitcoins being donated to the Free State Project the day after PorcFest, and an additional 0.12 bitcoins to Fr33 Aid. 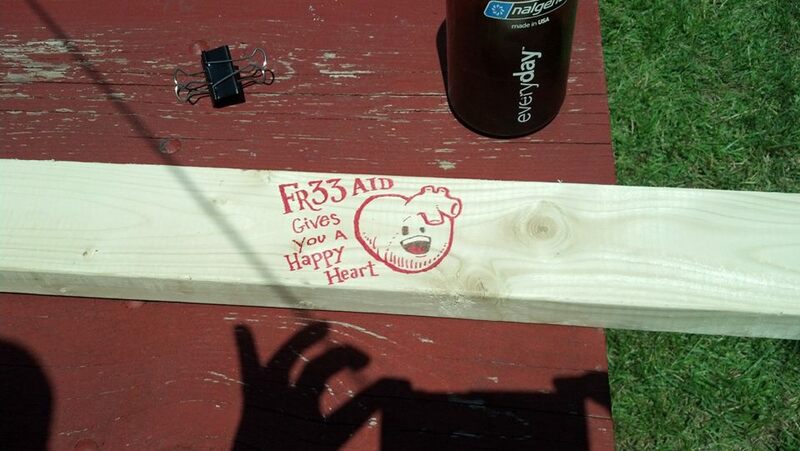 Deepest thanks to everyone who made PorcFest fun and successful, with special thanks to Fr33 Aid’s sponsors, volunteers and supporters.